Hi Friends! This Summer has been an absolute whirlwind in the Matt/Chelsea abode. We have some big plans for our home which have lead to emptying out, decluttering, and starting fresh. And in our experience thus far, starting fresh in a house we've lived in for 8 years is no small feet, (especially a house that was built in 1980). It's like moving but we're not going anywhere. When we moved into this house we had two babies, one in the oven, and a whole crew of people who helped us get settled. Now, all these years later, the task ahead feels daunting. Some rooms simply need fresh paint, others a bit more than that. We've listed out what we need to do and are just going to check things off one by one! One of our first steps was emptying out all our closets and dressers a few months ago and really pairing down. You wouldn't move with things you don't use anymore, so in the same way we got rid of things we don't use anymore. In all the emptying out, I found myself with A LOT more room in my dresser. It was a great feeling to keep only favorites, but that meant I needed to downsize my dresser! I took to the Habitat for Humanity Restore with the kiddos and found a winner within minutes! Anyways, I used this new find as an opportunity to test out a color we are considering for a kitchen island - 'Salamander' by Benjamin Moore. It's a deep tealy-green and a color I can see in our home for the long haul! Obviously it's been a long time since I've refinished anything - notice the one bare leg in the center! Hah! Didn't even notice it until we'd brought it inside! 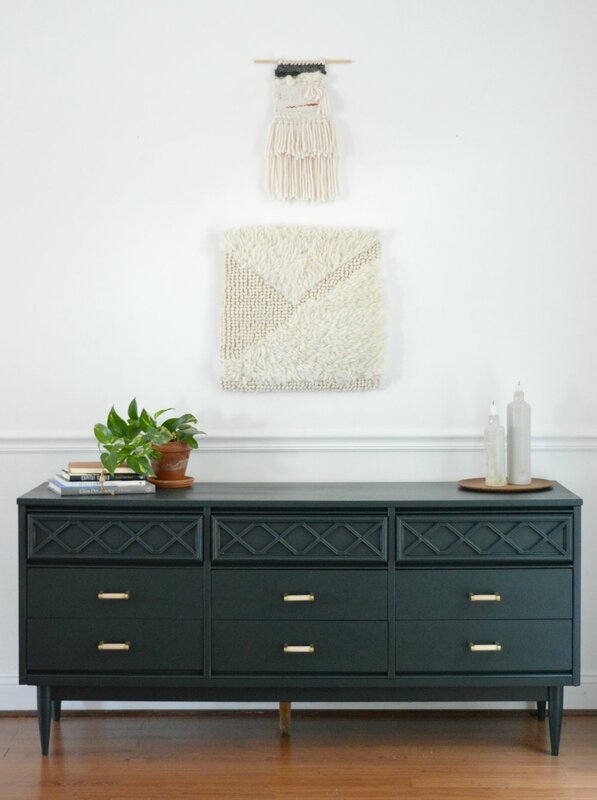 The pulls were an Anthropologie clearance find, and I love the brushed metal against the blond wood. I don't use a lot of brass in our home, but any brass we have is brushed or aged in some way. My personal style is very 'campy'; it's minimal and super laid back, and I use a lot of bare wood in our home. So this piece represents two winners in one! I've got a new dresser and we've got a color for our island! I'll be back again soon to lay out the plan for our upcoming kitchen renovation - the first of many steps to wake up our home, but we'll get there!